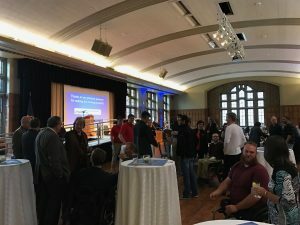 Nearly 120 friends and supporters of Able Flight gathered at Purdue University for Able Flight’s yearly celebration and benefit event on Saturday, April 29th. The celebration and fundraiser was Able Flight’s fifth annual party to honor our pilots, and to thank our friends for making our scholarship and training program possible. A large group of returning Able Flight pilots were the VIPs of the evening, including Jessica Scharle, Sgt. Jason Gibson, Curtis Stanley, Jason Jernigan, Wesley Major, Jessica Cox, Stephen Carrier, Justin Falls, Raymart Tinio and Dennis Akins.Also attending were 2017 scholarship recipients Benedict Jones and Kathryn Brenner. 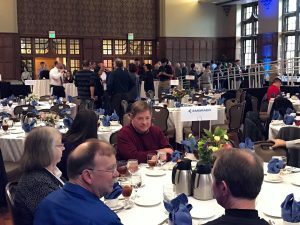 Thanks to the generous support of event sponsors Embraer, Flexjet and Muncie Aviation, all proceeds from the sale of table and seats and the auction went to Able Flight’s Scholarship Fund. The combination silent and spirited live auction included items from L-3, Shell Aviation, Patty Wag staff, Garmin, ForeFlight, Sennheiser, Scheyden, Sporty’s Pilot Shop, Concorde Batteries, Bombardier and Abingdon Watches. The Tad Robinson Band followed the auction, featuring Robinson, an 8-time nominee for top artist and album of the year in the blues soul category. Our thanks to our friends at Purdue University, especially professor Bernie Wulle and Able Flight pilot Wesley Major, and to Chris Throndsen and Sue Stites for their assistance with the party.